As a part of the celebration of GANIT week, the following activities were conducted in the school. 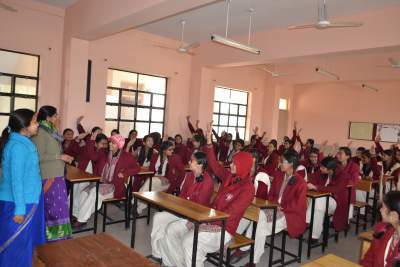 16-Dec 2014 A lecture by a senior Maths teacher, on how to make the study of Mathematics more interesting and on how to reduce the fear of learning Mathematics, was delivered to the students of classes IX and X . 17-Dec 2014 An Essay Writing Competition was conducted for classes IX and X . Topics were as follows:Class IX- Sh. Srinivasa Ramanujan Class X- Mathematics in daily life Out of the many contributions, the best five entries have been chosen. 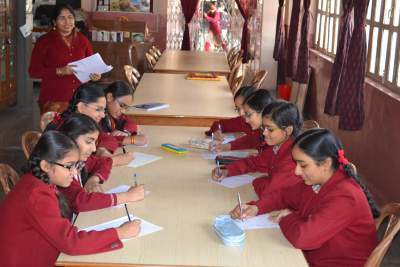 18-Dec 2014 Students of classes I – V were encouraged to participate in a Quiz competition which involved 2 rounds including Mental Maths and Brain Teasers.A puzzle solving competitionclasses VI – VIII. 19-Dec 2014 Students of classes IX and X were brought together to share with their teachers their experience on innovative ideas in the field of Mathematics. The senior students enthusiastically explained the new ideas and avenues they had explored while they were involved in the FormativeAssessment projects. (As the school will remain closed from 20 Dec 2014 to 4 Jan 2015, for winter vacation, the Poster Making Competition was conducted on 19 Dec 2014.) 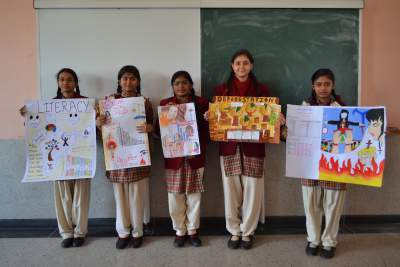 This competition held for classes IX, X and XI, was based on Statistics, where the students chose topics on ‘Save Girl Child’, Deforestation, literacy,etc. The best five presentations have been chosen. Thus the GANIT week was successfully conducted and it came to an end with the distribution of certificates to the winners. The second week to the third i.e 16th December to the 22nd December ’2015 saw the celebration of the GANIT (Growing aptitude in numerical innovations and training) week , to commemorate the 128th birth anniversary of DR. Srinivasa Aiyangar Ramanujan on 22nd December 2015 ,organized by the CBSE. The celebration began with the Mathematics Relay Race, organized by the Mathematics Club ,on the 16th The students were induced in the activity in 2 categories i.e (III TO V ) And (VI to VIII) .The relay race was as planned. The relay moved forward , only after the students were subjected to a set of questions. The students actively participated with interest and cheer! The second activity was conducted on the 17th , was solving the Mathematical Puzzles such as solving Rubik’s cube and creating magic squares . The students of VI To VIII participated in it .It was enjoyable experience for them. The Interactive Session On Mathematics was conducted on the 18th December , for classes IX to XI .the students were involved in interesting discussion about the role and use of mathematics and its supplimation in the various aspects of nature and universe .The students had to share much with their teachers . The Mathematical Design Competition ( 19th Dec) was the fourth activity .The Geometrics and the similar feature were used to make formations with mathematical formulas . It was quite involving. The next activity was the Mathematical Game like Sudoku which was given to the students and they (Class VIII to XI) solved them in the time span allotted to them. The final activity was Model Making, conducted on the 22. The models were to make three dimensional combinational bodies. They were interesting and innovative. The activities culminated in all Exhibition of charts, posters and models made by the children.